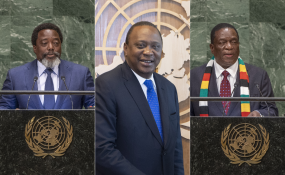 Presidents Kabila, Kenyatta and Mnangagwa. With more years of peace than the preceding years of war "Liberia has finally turned the corner", the country's President told world leaders at the United Nations General Assembly, pledging his efforts to consolidate the nation's achievements and bring peace dividends to all Liberians. In his address to the general debate at the Assembly's 73rd session, President George Manneh Weah of Liberia expressed appreciation for the UN peacekeeping mission in his country, UNMIL, noting that it brought stability and helped rebuild Liberia's institutions and communities. "We are a peacekeeping success story, and we are grateful for the support given," he said. President Weah, who succeeded Ellen Johnson Sirleaf as the country's leader in January this year, said that it was the first time in 73 years that Liberians enjoyed a peaceful transfer of power from one democratically-elected Government to another. "The challenges of leadership are enormous, but in each and every one of these challenges, I see opportunities to make things better, and to bring permanent improvements to the lives of all Liberians," he added. The key policy to that end, explained the Liberian President, is the Pro-Poor Agenda for Development and Prosperity, the country's national development plan for the next five years, with a focus on youth, infrastructure and agriculture. "Our Pro-Poor Agenda is designed to give power to the people, promote economic diversification, protect sustainable peace and encourage good governance," he explained, urging all stakeholders to support his Government's efforts. Concluding his address, President Weah reaffirmed the West African country's support to the United Nations and work to reinforce peace and security in the ECOWAS region as well as in the wider African continent.